Chelsea legend has had his say over who’s the greatest player of the beautiful game of football, and it’s not Lionel Messi. The former Blues star won multiple accolades during his time at Stamford Bridge, becoming one of their most beloved players during his tenure there. But while the former Chelsea star was renowned for his goal-scoring prowess, Didier Drogba has had his say about who is the greatest player to ever step foot on a football pitch. Barcelona star Lionel Messi and Real Madrid’s Cristiano Ronaldo have been a part of an two impressive debates for the better part of a decade, with both fans and critics on the line about the two superstars. While Messi has over 600 goals for club and country, five Ballon d’Ors, four Champions League trophies, Eight La Liga crowns, three FIFA Club World Cups and numerous others accolades, the Portugese star has equaled the Argentine step-by-step, trophy by trophy. However, Chelsea legend Didier Drogba who is renowed for his goal-scoring prowess has decided to chip in with his point of view. In an interview with AFP, the Ivorian went on to say “Messi could stop now and he would already have done a lot for football. To win a World Cup would make him even more legendary. The Barcelona superstar has shown his worth this season with more than his fair share of impressive performances, leading the team to the top of the La Liga despite losing Neymar. While the club did bring in the likes of Ousmane Dembele and Philippe CCoutinho, Lionel Messi’s presence has been more than enough to fill the gapping hole, Neymar left on his way to PSG. 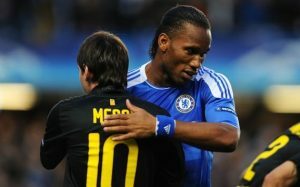 Drogba is right in his own way, as winning a lifting his first major honor with Argentina will certainly give Lionel Messi the ultimate edge in the argument between him and Ronaldo. But it will also put him among the likes of Pele, Maradona, Johan Cruyff, Ronaldo Nazziro, Garincha and many others.